This report was created to answer fundamental questions about the voluntary carbon markets such as transaction volumes, credit prices, project types, locations, and the motivations of buyers in this market. Over the past several years, these markets have not only become an opportunity for citizen consumer action, but also an alternative source of carbon finance and an incubator for carbon market innovation. As the voluntary carbon markets have rapidly gained traction, the answers, to these questions have become increasingly important to investors, policymakers, and environmentalists alike. 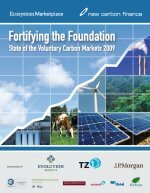 For example, since the last edition of this report, we have seen various U.S. climate bills make reference to voluntary carbon offset standards, the Japanese government launch a voluntary carbon-offsetting scheme, and the U.K. government issue an official definition of carbon neutral.